Abstract. This paper explores the convergence of anthropology and ecology in the recent work of Peter Sloterdijk. Firstly, it is argued that Sloterdijk proposes an important new interpretation of Heideggerian Gelassenheit for which I propose the English word `relief '. The concept of relief rests on the substitution of ontological difference by what I propose to call 'natal' or 'natural' difference. Secondly, I will develop the significance of these concepts in relation to complexity theory and cybernetics, focusing on a key subject in the Sphären trilogy - insulation - and on a key subject in Sloterdijk's essays on Heidegger - homeotechnics. Thirdly, it will be shown how the concepts of relief and natal difference can be further developed into an ethico-aesthetic paradigm for experimentation with new technologies, based on a reinterpretation of the Gestell as total work of art. 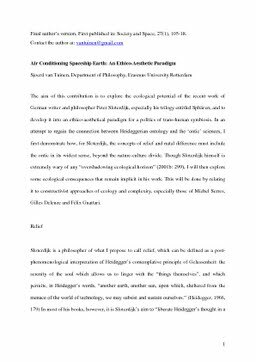 Finally, by relating Sloterdijk's work to that of Michel Serres, it will be demonstrated why, for Sloterdijk, this paradigm finds its exemplary modal in the spaceship.